Fun style jumpers. simply push down hard onto a smooth surface and watch as it pops up into the air! Each Jumper comes in a different colour and design- all with wacky, colourful hairdos Each one a perfect opportunity to express yourself. Great for party bag gifts and pocket money purchases. JUMP UPS MONSTERSHave some fun with these springy monsters! Great for gift loot favour birthday bags..
SMILEY EMOJI JUMP UPS Fun Toys Jump Up Smile Faces are fun style jumpers. 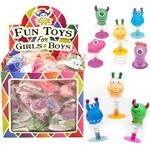 simply push down hard..
Fun Toys Jump Up Smile FacesFun style jumpers. simply push down hard onto a smooth surface and watch..
SMILEY EMOJI WITH FUNKY HAIR - JUMP UPS Fun Toys Jump Up Smile Faces are fun style jumpers. sim..